When I play board games, I always thought of them as toys that bring families and/or friends together to cherish joyful memories. While I play games such as Monopoly and Life, I feel as if I’m immersed in an imaginary world where I grew from a kid to a grandparent within an hour or I went bankrupt in no time to building an amusement park within seconds. The scenarios were absolutely unrealistic, but yet fun. Rohit Chopra, a writer of the article, Did Board Games Help Cause the Recession?, raises a very interesting question regarding whether board games do truly teach us the values of economics. I am not sure if I can agree with Chopra or not. 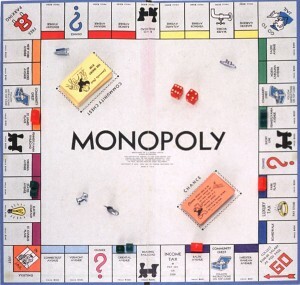 I never took Life and Monopoly games seriously or thought of them as vehicles to teach us real life lessons. Board games were like fiction books where they just simply put us in another world. Monopoly and Life are also representations of the American culture because they teach the values of capitalism and materialism. Americans, in general, like to think that capitalism is the best way to handle the economy and being materialistic is a wonderful value; thus, it is expected to find those values in these games. My parents provided me lessons on how to earn, save, and spend money starting when I was five years old when I first began to earn allowances. They also taught me to think of the ‘magic cards’ as an electronic wallet where money is stored, and if we wanted to take paper money out of the card, we had to go to the bank so that the special machine could do it. While it is interesting to think of board games as objects that could teach children lessons and create an impact on our cultural values, I wouldn’t blame on the board games for the economic problems. It’s many of the parents whom are not teaching children how to finance and explaining how economy exactly works.